If you’re unsure how American beer is viewed in Germany, ask Sylvia Kopp [the Brewers Association’s newly appointed ambassador to Europe]. 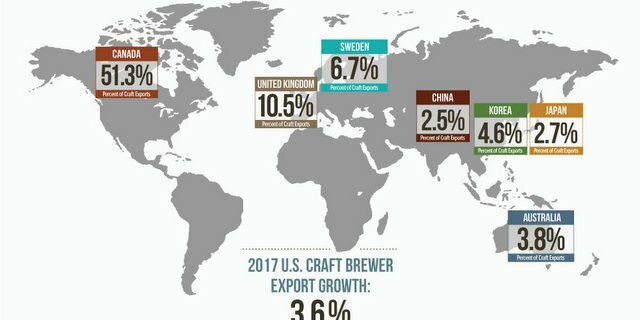 Yet despite American stereotypes and hurdles in Germany and beyond (things like overcoming a high price point, “unusual” flavor profiles, poor distribution in stores and bar loyalty to select brands), craft breweries are still making impressive progress selling to overseas markets with more than 15 percent growth last year, according to a recent report from the Brewers Association (BA). That’s a huge number, but alas, it’s still less than half of the 36 percent growth of 2014’s craft beer market. Hey, you can’t have insane growth every year. Supported by the BA’s innovative Export Development Program (EDP), craft beer export volume increased by 16.3 percent in 2015, now totaling 446,151 barrels worth $116 million. Growth was seen in all major markets, according to the report, and most notably in Western Europe which saw a 33.4 percent increase. Interestingly, Ireland, the Netherlands, Thailand and Taiwan were the fastest growing markets in 2015. Canada was again the leading international market for American craft beer, accounting for 51 percent of exports. Meanwhile, Sweden, Ireland and the United Kingdom each took a market share of approximately 10 percent. The top five was rounded out by Australia, which accounted for 4 percent of exports. There was no word on where those beer-loving Germans landed.